These days, C.J. 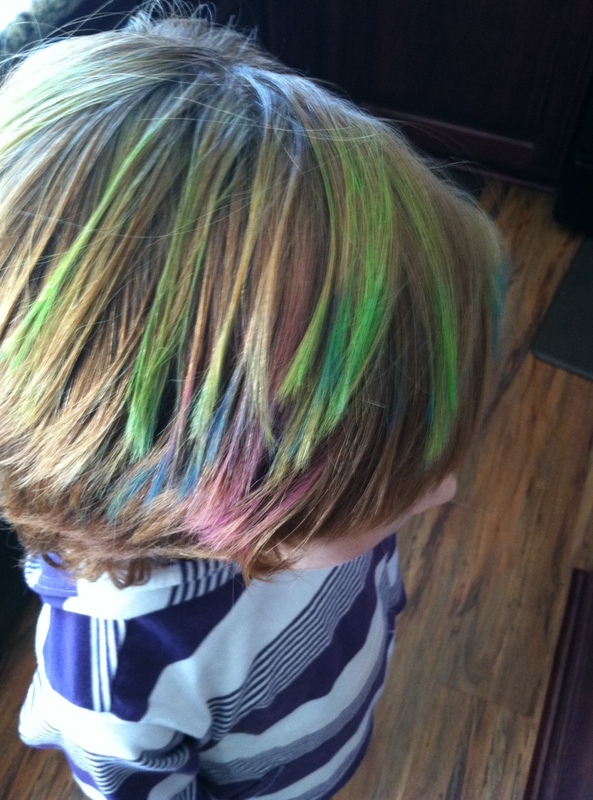 likes to chalk his hair before school. When you have a child with special or unique needs and a stranger treats them amazingly when they don’t have to, it makes you feel so damn good. It gives you hope and restores your faith in humanity. C.J.’s hair stylist, Miss. Crystal, is one of those people. We met Miss. Crystal three years ago. We hadn’t been to Cool Cuts 4 Kids in a while and decided to try it again after a particularly unpleasant experience at Hair Masters (during which the stylist was confused by C.J.’s gender nonconformity, gave him a horrible haircut and made us both cry). We walked into Cool Cuts 4 Kids and C.J. saw the “Princess Chair” in the back, right corner of the La Jolla hair salon. The Princess Chair has tulle draped around it and a pink canopy above it. It’s the station where they keep the hair beads, glitter, extensions, hair tinsel and clip-in feathers. The chair faces a Tinkerbell television on which the child can watch their pick of princess, Barbie or Strawberry Shortcake movies while the stylist works magic. I wish my salon had a Princess Chair. Of course C.J. wanted to sit in that chair. The other stylist’s chairs had firefighter, police and video game themes. The next available stylist approached the waiting area and called C.J.’s name. C.J. pointed to a Strawberry Shortcake movie. Miss. Crystal was unfazed. She grabbed it without thinking twice. “What chair do you want to sit in?” she asked. C.J. looked at me. He didn’t want to tell her that he wanted to sit in the princess chair. He was nervous about her reaction. “Can he sit in the princess chair?” I asked. “Of course,” she said, not missing a beat. Miss. Crystal is energetic and kind. She’s in her twenties and her hair has been several colors since we’ve known her. Miss. Crystal can French braid short hair. For every haircut in the three years since that first visit, C.J. has sat in the Princess Chair and talked and talked and talked with Miss. Crystal. They giggle and gossip and it’s as if nobody else in the world exists. I sit on the nearby bench reading Us Magazine, happily feeling like the third wheel. Miss. Crystal knows all about C.J. She knows that he just had a birthday party at the American Girl Doll store; that he was Frankie Stein one year for Halloween, then a fairy and, most recently, Tim Burton’s Alice in Wonderland; and that he loves Monster High. One time, she saw Monster High stickers while she was running errands and bought them for C.J. She kept them in her locker until our next appointment. Just because. Miss. Crystal and C.J. share a love for all things Disney. Whenever someone mentions Disneyland, C.J. informs them that his hair stylist is a season passholder. For him, it’s bragging rights. When we first started going to Miss. Crystal, C.J. was growing his hair out. She helped give it shape and thin it out so that it lay better. It was past his ears and on its way to his shoulders when he decided to cut it before Kindergarten because he was worried that he’d get teased. Miss. Crystal was afraid to cut it. She was afraid that he’d hate it and, in turn, hate her. She took off a few inches and swore that if he still wanted it short the following week, she’d take off the rest. She kept her promise, but was sad to see his auburn locks hit the floor. We gave each other sad faces behind C.J.’s back. C.J. doing Miss. Crystal’s hair. Since then, she’s been helping us grow it out again. It’s the longest it’s ever been and he proudly wears it in a ponytail to sleep. Miss. Crystal has given C.J. blonde extensions, a full head of magenta glitter and has French braided his hair when I thought it was too short to be braided at all. She’s talked to him about what it’s like to be a hair stylist. And, now, he wants to be one too. And, own a salon. And, work with Miss. Crystal. And, I’m supposed to make lunch for them every day. Knowing this, now, when Miss. Crystal is done with C.J.’s hair, she lets him do her hair. During his last visit, he gave her the ponytails that she requested. Doing her hair is the favorite part of his hair appointment. It’s my favorite part, too. This entry was posted in All Posts and tagged Cool Cuts 4 Kids, Gender, gender creative, gender nonconforming, Gender Stereotypes, hair, LGBTQ, Monster High, parenting, raising a gay child, Raising gay child, Raising My Rainbow. Bookmark the permalink. I’m really surprised at all these statements as to how boys can not have long hair. Does no one remember the 60’s? We ended the idea that boys had to wear short hair. And we established that long hair is unrelated to being feminine. It seems that all of this has been lost and indeed forgotten. All I have to say is, you’re awesome! I just finished reading your book. Got on here to check you out and I just love you and your family! C.J. Is so lucky to have each and every one of you! Keep it up! I’m a stylist and I’d like to think of myself as the Miss Crystal kind. I have gender-fluid boys who want long hair or braids and I’ll gladly do whatever they want. I even keep a stock of pink ribbons that a few boys have been thrilled to get. But i absolutely hate it when some moms are literally forcing their sons to have girly hair. One little six yr old had waist length blonde locks that his mother insists he wants. But the poor kid keeps telling me quietly that he doesn’t. And several times mom has asked that I use a flat iron on it to give him ringlets! I feel so sorry for him and I hide my ribbons when I see him coming. This post made me tear up. Thank you. LOVE this! Yes, I hope Miss Crystal sees this! Two thumbs up! 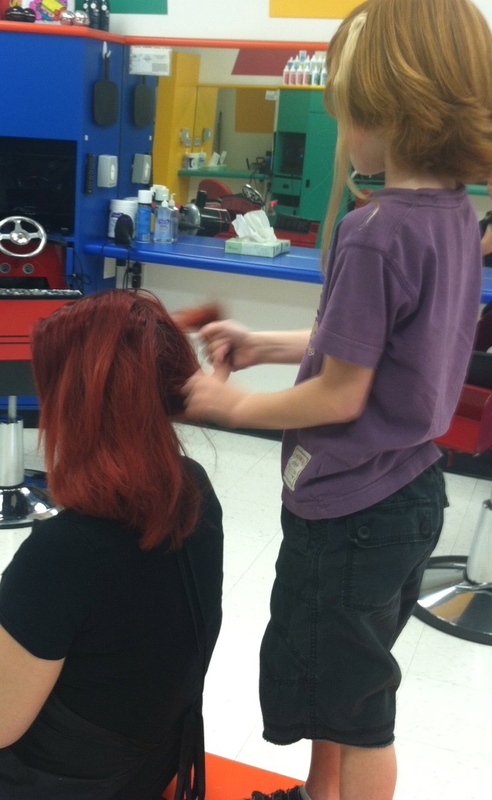 My (non-gender creative) son had very long hair in grade school, and was often mistaken for a girl. When signing up for orchestra in 4th grade, the teacher, who was meeting the kids for the first time, pointed to my son and said “You’re next, young lady.” I smiled and quietly corrected him to “Young man.” Teacher blinked once and was fine. After they had finished, he pointed to the next child, who had cafe au lait skin and short dark brown curls and said “OK, young man.” Her mother smiled and gently corrected “Young woman.” The teacher blushed and corrected himself. He later thanked the other mother and I, and said he had learned a valuable lesson: Not to pre-judge based on looks. 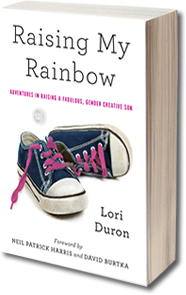 And while neither of our kids was gender creative, we were happy to help break a few stereotypes. This is so beautiful to read! At my son’t pre-preschool, there is a little 2 1/2 yo guy who was wearing a dishtowel on his head to school every day because he wanted long hair so much. So one of the teachers bought him a beautiful long pink wig, and now he wears it all the time. He is so beautiful to begin with, and now with his new hair, he just looks right. It just makes me so happy to see him supported. Almost as lucky as your son is to have you! He has now 2 heroes. Miss Crystal and Chad Alan. I think I’m in love with Miss Crystal. She probably doesn’t even realize the impact she is making in both you and C.J.’s life. The world needs more people like her! I love that story. I just read your book for our Book Club and just thoroughly loved it. You are TERREFIC parents and both Chasr and CJ are lucky to have you. 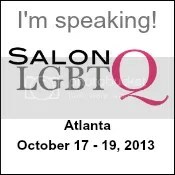 Our hairdresser is awesome too and I am so thankful. I recently told her that my child, whose hair she has been cutting in cute boy styles for five years, has told us he is a boy-girl. And now Kegan wants to grow his/her hair out like a girl. I don’t know her beliefs or principles….I was quite nervous. She said, “Okay, I think we should let people be who they are.” And that was that….it is nice when people just choose kindness and acceptance! I’m so, so happy that C.J. found a hair stylist that he likes, and more importantly, a hair stylist that knows him. Hair is such a big part of how we express ourselves, and it’s almost silly – yet totally understandable – how it can mean so much to us. I usually have the opposite problem as CJ, walking into a hair salon wanting a boy’s cut while I still identify as a girl, and I know just how awesome of a feeling it can be to have a hairstylist who promotes your individual style. I am beyond happy that C.J. got someone as awesome as Miss.Crystal. This is absolutely beautiful & absolutely made my day! This made me happy, what a wonderful person! In the many years, I’ve been reading your delightful posts, this one has somehow managed to outshine them all! I laughed, I cried and I saw a vision of a glorious future career for CJ! If it happens to come true, I will gladly make an appointment at that salon!! He has great hair! My son wants to grow his out and the whole in between hair is the hardest. This coming from someone who grew out a pixie! Tell CJ he looks great to all of us! I really need a smile today. This is awesomely awesome! Love this post. Everyone could use a Miss. Crystal in their lives! So glad your family has found her. That is so nice to hear. There’s still hope in the world, then, I guess! Hats off to Miss. Crystal. Your blog does give me hope for humanity. Thanks. Honestly…crying here…because having people like Miss Crystal in all our lives is such a rare gift. Well, it’s official, I love Miss. Crystal! These are the type of people who give me strength to slog it out with all the other encounters we have. Hurray for Miss. Crystal and CJ! Miss Crystal is a hero. She is SO the kind of person we would want to be friends with! Amazing!!!!!!! My son has a stylist like that too. She is also his dance teacher. I so love this!!!! And I love you for giving your child this freedom, something I was to ignorant to do for my son, and I love Crystal!!!! For my adult transgender clients it can be a life-changer to find a stylist who sees them for who they are without a bat of an eye. So nice to hear this story! I am so glad that C.J has her she sounds amazing. I allowed “my CJ” to cut my hair once. I thought,”What the hell, he can’t REALLY screw it up. I can always go shorter and have it fixed at the salon.” Well, he grabbed those scissors with gusto and took a hold of the front section of my hair, to make bangs, and voila! it was nearly gone! I think I ended up with about 1/2″ bangs!! I then had to explain to him that next time (if there was a next time!) he should not cut it as short because as it dries it gets shorter. A good laugh and nothing a baseball cap didn’t cover until it grew out a bit. A friend of mine has a son cjs age that loves to “do hair”. I let him style mine all the time and truth is he’s quite good at it. It would be a dream come true, I’m sure, if we could find him a miss crystal. Amazing! My sister is a hair dresser too, and i know she is just like Miss. Crystal! 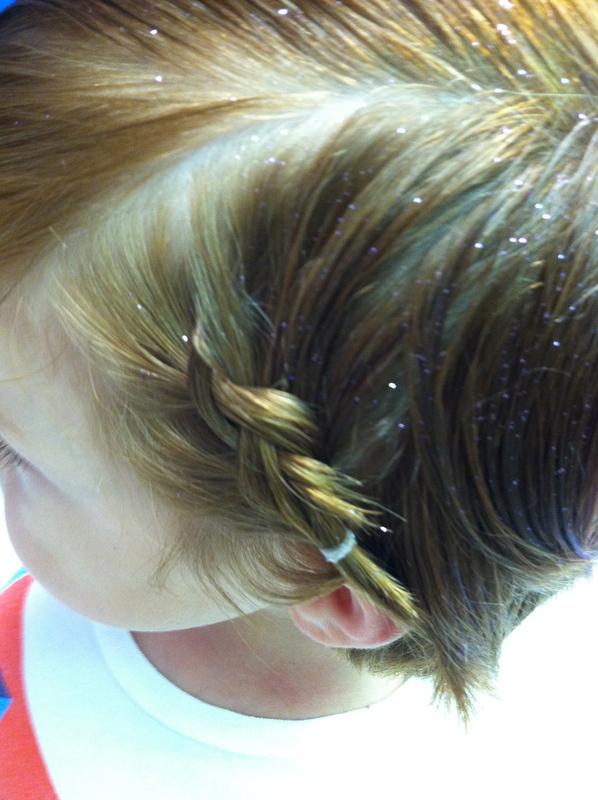 my son loves to do hair also. I will try to post you a picture of how he braids. he actually does his ccd teachers hair . he almost pulled out her extensions a few classes ago !!! chip off the old block !! lori im a hair dresser and I do all that for my son!! he loves having me for a mom , he said he wants summer highlights this year !! I said you got it !! I love these boys!! This is the first post that has brought me to happy tears. Miss Crystal ROCKS!!! What a fantastic child advocate. I am happy that you all found each other. This is the first post that brought happy tears to my eyes. Miss Crystal ROCKS!!. She is a fantastic child advocate. That’s wonderful 🙂 One time Jeremy wanted to cut his hair and donate it. We ended up with not one but two hair dressers arguing with us that “she couldn’t cut her hair that short because then she’d be mistaken for a boy”. Then they wouldn’t believe him when he said he was a boy. Actually, they barely believed me. It was *interesting*. For every a–hat in the world, there are (I hope) many more Miss. Crystals. They are the ones who matter; the rest of the people are just taking up space. How wonderful you and C.J. have found her. And how fantastic you shared this story with all of us. Always great to find a kindred spirit! This made me cry happy tears. I want Miss Crystal to do my hair too, what an AWESOME human being. What a wonderful person she must be. We go to Cristal too!! We love her and she is the only person allowed to cut both of my boys’ long hair. She pleaded with my older son NOT to cut his hair. :). She is a sweet, genuine person and I’m so glad she is in your lives too!